A great many Tolkien fans were dismayed by the portrayal of Radagast the Brown in Peter Jackson's adaptation of The Hobbit, especially the invention of Radagast's mode of transportation: a sled pulled by superpowered rabbits. But is the notion of a woodland wizard traveling by bunny sled really that absurd? A recreational musher examines the realities of magical bunny sledding. The piece was written for TheOneRing.net by Teanne Byerts, who isn't a 16-dog-team racer, but does drive dog sleds, mostly with her own four dogs. She approaches the possibility of Rhosgobel Rabbit from both the idea of reality and fantasy, noting that the Rhosgobel Rabbits are supposed to be larger, stronger, and faster than rabbits in our world, but also examining the practicalities of Radagast's mode of transit. 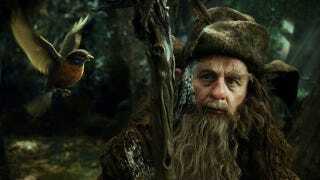 Radagast has his gangline attached to his brush bow. This is a sure way to have your super-powered Rhosgobel Rabbits pull your sled apart. The gangline is attached by way of a network of rope, called a bridle, to every upright “stanchion” on the sled, spreading out the stress. I have since seen some clearer pictures of the sled; it appears to have a support “keel” down the center, the brush bow attaches to this keel. Perhaps this is enough to strengthen it. Byerts' essay is an entertaining read, one that mixes dog sledding and fantasy in an unexpected way—including contemplating the magical friction-reducing qualities of wizard spit.